There aren’t many things in minor hockey that taste sweeter than capturing the OHL Cup. The York Simcoe Express snacked on chocolate danishes prior to puck drop Monday evening, but rallying to beat the number-three ranked Toronto Marlboros 2-1 in double overtime was definitely more satisfying. The win capped a tremendous year for this group of 15-year-olds, who managed to claim the minor midget equivalent of the triple crown – an OMHA championship, an International Silver Stick title and now the OHL Cup. Rhys Forhan scored both Express goals, including the game-winner with 2:43 left in the second overtime when his wrist shot squeaked under the pads of Marlboros goalie Elliott Tang. 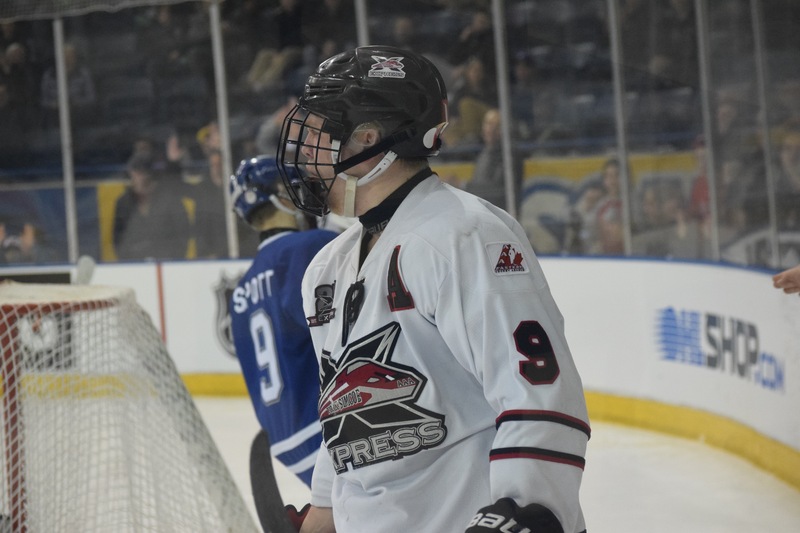 Express goaltender Andrei Berezinskiy, who made 39 saves in picking up the victory, received the Tim Adams Memorial Trophy as OHL Cup tournament MVP. Just over 10 minutes into the game, Marlboros defenceman Pierre-Luc Forget opened the scoring when his wrist shot caught a piece of Berezinskiy before trickling over the line just moments after Tang turned aside a two-on-one. Tang entered the game having not allowed a goal in 125 minutes and 30 seconds of action and saw his streak extend to 205:23 before Forhan tied the game in the third period. The Express forward took a perfect cross-ice pass at the face-off dot before finishing with a sweet backhand-forehand move to even the score. Extra time was needed for the second year in a row and for the third time in OHL Cup final history – all involving the Marlboros. The first such game saw the Mississauga Rebels pick up a 2-1 win over the Connor McDavid-led Marlboros in 2012. After yielding the early goal, Berezinskiy stood tall the rest of the way. As he did all tournament long, Berezinskiy continued to make monumental saves to keep his team’s deficit to one goal through two periods of play. He made a number of key stops, including a save on Thomas Tinmouth late in the first period on a partial breakaway then again early in the second when captain Allan McShane broke in with a promising opportunity off the rush. At the other end, Tang stopped 30 shots including stop from in-tight on Ian Vucko with 4:37 left in the first overtime. Express alumni wished their former team luck throughout the day, including St. Louis Blues goaltender Brian Elliott. Best of luck to @YSExpress minor midgets in the OHL cup finals tonight vs the marlies. Go get em boys! The Marlboros had their best chance to increase their lead in the first period when McShane rang a shot off the post for the GTHL-championship hopefuls. Between Tang and the Marlboros’ gap control and ability to obstruct passing lanes, the OMHA champions had little to work with before their tying goals. The victory marked York Simcoe’s second OHL Cup win and first since 2004, the second year of the revamped tournament.